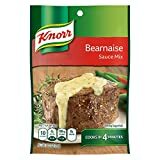 Béarnaise sauce is a French sauce which is traditionally eaten with steak. The sauce is made from clarified butter, egg yolk, shallots, tarragon and vinegar. For the perfect French flavor to your cooking! Net Weight: 4.4 oz/125 grams.